Mechanical Testing Laboratories at WMT&R Inc.
“The Mechanical Testing Labs at Westmoreland Mechanical Testing & Research, Inc (WMT&R) perform destructive testing on a wide range of materials in accordance with all applicable ASTM Standard Test Methods as well as testing to customer specific specifications”. 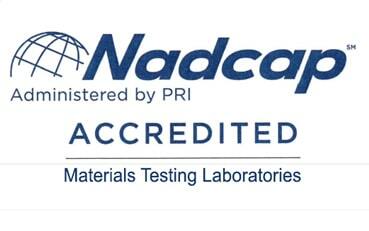 WMT&R Mechanical Testing Labs are accredited by both Nadcap and A2LA, as well as approved by over 60 companies in the Aerospace, Nuclear, Automotive, and Medical fields. At Westmoreland Mechanical Testing & Research, Inc (WMT&R) tension and compression tests are conducted on an impressive range of machines with capacities from 10 grams to 1,000,000 lbs. Testing is conducted in various atmospheres (Argon, Vacuum, Corrosive Mediums) at cryogenic, ambient, and elevated temperatures (-450°F to +2200°F). Our proprietary testing software provides us with the capability to run standard tests plus full stress/full strain tests at various strain rates, crosshead speeds, load ranges, and strain ranges as your requirements demand. Expertise in preparing and testing round micro-size specimens (less than 0.005" thick). Impact Testing most commonly consists of Charpy and IZOD Specimen configurations. The Charpy tests are conducted on instrumented machines capable of measuring less than 1 foot-pound to 300 foot-pounds at temperatures ranging from -320°F to over 2000°F. 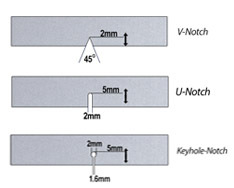 Specimen types include notch configurations such as V-Notch, U-Notch, Key-Hole Notch, as well as Un-notched and ISO (DIN) V-Notch, with capabilities of testing sub-size specimens down to ¼ size. IZOD testing can be done up to 240 foot-pounds on standard single notch and type-X3 specimens. Drop-Weight Testing is preformed to ASTM E208-Standard Test Method for Conducting Drop-Weight Test to Determine Nil-Ductility Transition Temperature of Ferritic Steels. This test is conducted to determine the nil ductility transition temperature (NDT) of materials. Tests can also be conducted to your temperature requirements from elevated temperature down to -320°F. 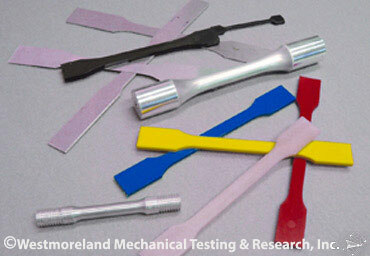 Dynamic Tear Testing has a wide range of research and development applications. Used to study the effects of metallurgical variables like heat treatment, composition, and processing methods on the dynamic tear fracture resistance of material. Manufacturing processes, such as welding, can be effectively evaluated for their effect on dynamic tear fracture resistance. 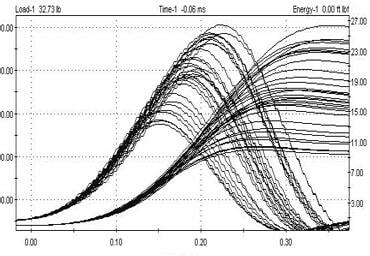 Additional uses for this test include evaluating the appropriateness of selecting a material for an application where a baseline correlation between Dynamic Tear energy and actual performance has been developed. Stress and Creep Rupture Tests are conducted at temperatures up to 2200°F to either ASTM E139-Standard Test Methods for Conducting Creep, Creep Rupture and Stress Rupture Tests of Metallic Material or ASTM E292-Standard Test Method for Stress Rupture Combination. Temperature and creep readings are continuously monitored and recorded digitally to ensure utmost accuracy. The creep test program is capable of recording strain readings up to 120 times per hour. This data is utilized to maintain temperature tolerances during the test, and to create a unique temperature history report. The reduced section of a creep test specimen can also be strain-gaged as a means of measuring the amount of strain during testing. 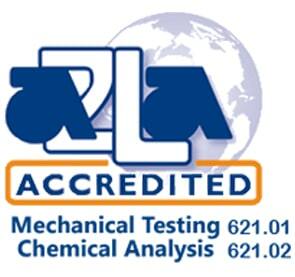 Stress and Creep Rupture Tests can also be conducted in environments under vacuum, corrosive, or inert atmospheres. Maximum temperatures for these tests exceeds 1700°F and are usually performed on materials that exhibit excessive corrosion at elevated temperatures in an air environment. Cyclic Rupture Testing is designed to load and unload a test specimen at certain time intervals. The test temperatures range from room to +2200°F. Prior to starting a test, four strain gages are attached to a test specimen to ensure that bending strains are within specified requirements. The Static Notch Test is performed at room temperature under a constant load for a minimum of five hours to determine if the material is notch sensitive at room temperature. The Embrittlement Relief Test is also performed at room temperature, but for 200 hours under a load of some percentage of either the yield strength or ultimate tensile strength. Typically, this test is conducted in accordance with ASTM F519-Standard Test Method for Mechanical Hydrogen Embrittlement Evaluation of Plating/Coating Processes & Service Environments at 75% of the yield strength to determine if the material is susceptible to hydrogen embrittlement. The on-site Mechanical Engineering laboratory at Westmoreland Mechanical Testing & Research, Inc (WMT&R) is staffed by specialists and engineers in product evaluation of actual prototype components and subassemblies. From custom design and fabrication of fixtures, to conducting the test, our mechanical engineers have the expertise and resources to assist our various testing departments in delivering data to customers in an efficient and timely manner. The on-site high-technology, full-service Machine Shop at Westmoreland Mechanical Testing & Research, Inc (WMT&R) encompasses a clean, temperature-controlled environment and state-of-the-art equipment, with the ability to machine all test specimens onsite. In addition to machining standard specimens, the Machine Shop at Westmoreland Mechanical Testing & Research, Inc. can custom-design and machine fixtures for testing finished parts, odd shapes, and difficult or exotic materials. WMT&Rs reputation for quality machining and superior turnaround times brings production work from other laboratories and mills. 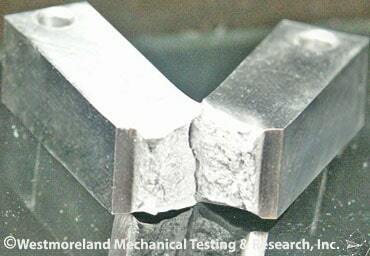 With advanced in-house capabilities, and substantial engineering experience, Westmoreland Mechanical Testing & Research, Inc (WMT&R) specializes in low-stress grinding and machining sub size specimens to very close tolerances. Below is a sample list of Mechanical Standardized Tests that Westmoreland Mechanical Testing & Research can perform. 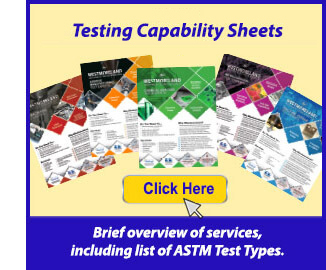 In addition to the following standardize tests, Westmoreland Mechanical Testing & Research, Inc (WMT&R) has the capabilities to test to individual customer specifications.